"Blue cheese crumbles kindly lend their distinctive flavor to this simple, smooth mixture. Serve with corn chips. 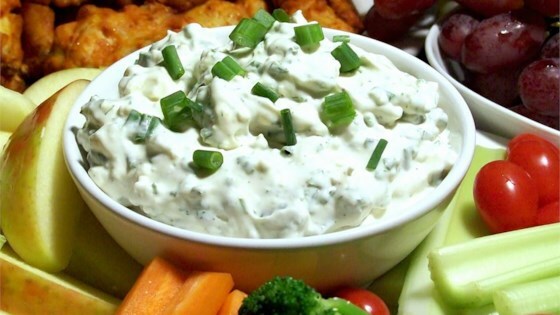 This dip tastes better the longer it chills before serving." Delicious!!! I added 1/2 tsp. cayenne just to spice it up a bit. This dip is excellent! I had to make it twice in one weekend because it was so popular. Was great with wings. Makes a great thick salad dressing too. Thanks for this recipe!